Part of an archipelago of six islands, a day trip to Phi Phi’s largest island, Koh Phi Phi Don, promises travellers an endless oasis of sun, surf and sand. Whether you want to sample traditional delicacies at the local market or discover beautiful sub-marine landscapes on a scuba diving tour, you’ll be spoiled for choice on this tropical island paradise. Plan your ultimate day trip with Radisson Blu Plaza Resort Phuket Panwa Beach’s guide to the top things to do on Phi Phi Island. Standing nearly 200 metres above sea level, this stunning viewpoint sees the island’s twin bays sliced in half by a pristine stretch of white sand. A crowd pleasing adventure suitable for all activity levels, the leisurely, 30-minute trek provides plenty of rest areas en route and ample food and beverage outlets once your reach the top. Whether you’re an experienced scuba diver or simply want to float along the surface, Phi Phi Island’s diverse marine ecosystem offers plenty of opportunities to experience life below sea level. With world-famous dive sites like the King Cruiser Wreck and Shark Point nearby, visitors can expect to see everything from moray eels and leopard sharks to sea turtles and clown fish – all without having to stray too far from shore. With towering cliffsides an integral part of Phi Phi Island’s landscape, it goes without saying that this offshore oasis is a haven for rock climbers. Regardless of your skill level, there are an abundance of half and full day tours that see some of Thailand’s most talented guides taking adventurous travellers to new heights above Koh Phi Phi Don. If a day of adventuring around Koh Phi Phi Don and the surrounding archipelago of islands leaves you craving a bit of local cuisine, make a beeline for the Phi Phi Market, where street-side stalls brim with exotic fruits and fresh-caught seafood. An excellent place to get a taste of Thailand, visitors to this nightly market can delight in a variety of delicious snacks, from chargrilled meat and fish skewers to traditional fried noodles. Ready to go? Getting to Phi Phi Island from Phuket is simple for guests of Radisson Blu Plaza Resort Phuket Panwa Beach, where all of the east coast’s islands are just a stone’s throw away. Speak to one of our friendly staff members and start planning your dream holiday today. 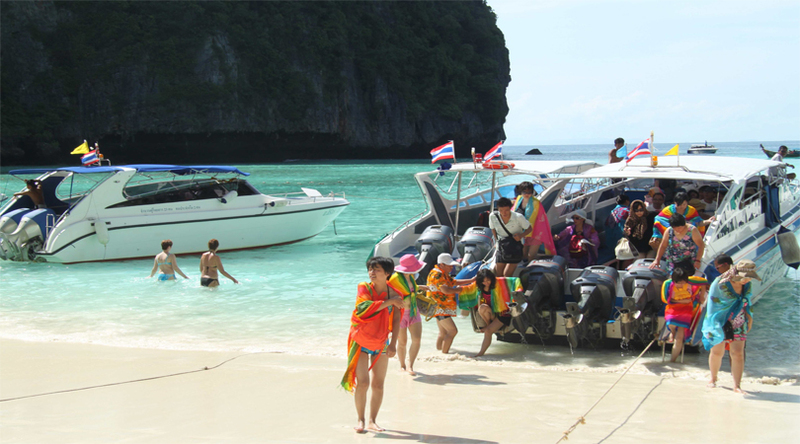 Keywords/Tags: Thailand, Phuket, Phi Phi Island, Travel.